I suppose it was inevitable in a season like this that the outsider going into the race should emerge as champion. And for once, it is a result that pleases everyone; even the Hamilton supporters being happy that Kimi has at last won the title. In typical Raikkonen fashion, he did what was necessary, winning the race with a little help from Massa and allowing the other contenders to make their mistakes. Well done, Kimi, you are a worthy champion. Kimi Raikkonen, World Champion at last! Hamilton was gracious enough in defeat, admitting that it was through his own mistakes that he failed at the last. The obstinate gearbox that dropped him down the field may well have been a factor in his loss but the most costly error was the decision to press on in China with tires that had given up the struggle. And Alonso had only good things to say about Kimi, although he couldn't resist the odd dig at McLaren as well. But this is F1, after all, and we couldn't possibly have a race that was free of controversy and decisions from the stewards. Does Bernie orchestrate these things to ensure maximum column inches in the days to come? Cool fuel was a new one, except that there was a precedent in the Brazilian GP of 1995. With the race result and the championship in doubt, then confirmed, and finally uncertain again after a McLaren appeal, we were treated to yet another embarrassing example of how contentious F1 has become. There is no need for me to go into the details; in his usual efficient style, Keith Collantine has provided us with a full breakdown of the rule and the stewards' decision in his excellent F1 Fanatic blog. I would ask just one question: why does the sport have a rule that is, according to the Brazilian stewards, impossible to police in practice? Once more we have proof that the rules have become too complex and nit-picking. This matter of cooling the fuel to fit more in the tank need never be an issue if the FIA would simply ban refueling. It has been a major cause of complaint over the years, being yet another reason for the lack of overtaking on the track (with drivers knowing that they can wait until the pitstops and make their passing move while the other guy sits in the pits); it is dangerous (as demonstrated by innumerable fuel spills and fires) and it creates this ridiculous complexity in the rules as teams seek to gain infinitesimal advantages through circumventing the most obscure recesses of the rulebook. Would it not be more sensible to insist on cars that can actually go a whole race distance without stopping for fuel? The whole idea of refueling was originally introduced as a way to "spice up the show" but it has proved to be the exact opposite, resulting in disruption of races, confusion as to who is ahead of whom, and even more space for intervention by the stewards. Quite frankly, refueling spoils F1 as a spectacle and as a sport. It must go, along with many other unnecessary and complex sections of the rulebook. I thought it was disappointing that McLaren decided to appeal against the decision of the stewards, although I understand how the team must feel after a season of being chastised and abused for every infraction of the rules imagined by the media and the governing body gone mad with lust for blood. Through it all, Ron Dennis has stood his ground as an honorable man and it is unfortunate that he weakened at the last and gave in to the temptation to hit back for a change. Not that McLaren will get any change, of course. Kimi Raikkonen is champion and that will stand; rules are rules, except when they might affect the desired outcome of the championship - or so it seems. For the beginning of restitution for all that they have suffered, the team must look to the outcome of their suit against Ferrari in the Italian law courts for illegal use of documents in the WMSC hearing. If I may return to the Interlagos race itself, however, I cannot resist pointing out something that may have been missed. Have a look at the list of fastest race laps. See that? Fifth fastest - Kazuki Nakajima! This guy, who was described by the commentators before the race as not really up to F1, put in a faster lap than his team mate, Nico Rosberg, not to mention Fernando Alonso and Nick Heidfeld. Okay, he did not qualify very well but that can happen to the best of drivers - just ask David Coulthard. But to put in a lap like that means he can't be entirely useless. He finished the race, too, in tenth spot. I hope Nakajima gets the second Williams seat in 2008. He has done enough with the one chance he's been given to earn it and looks capable of being the best Japanese driver to date. And isn't that a much happier note to end on than all this nonsense about cool fuel and undecided championships? You forgot one other danger of pit stops, running over your mechanics. I really hope the McLaren appeal is unsuccessful as to decide the championship in the courts would be a terrible way to end the season. Agreed, Craig, it is no way to decide championships. They are won over the course of a season and Kimi has done enough to win it several times, only to be deprived by bad luck. This is his year. Woot woot woot! Kimi is champion at last, I was incredibly glad to see that happen. I also laughed at the fact with what... 8 laps or something to go, Kimi in first all he needs to do is finish the race and what does he do - set the fastest lap of the race. Haha that's Kimi for you. I was getting a little scared at the end. Prior to his last stop the commentators (as useless as they normally are) pointed out that his left front looked like it was started to grain badly in one section..... I was just waiting for his tire to rip apart on his in lap. I now know why all the older fan base has stuck it out this long.... when it really counts F1 delivers! Yay for the Pootle - Kimi Champion at last! And you are so right - no slowing down and taking it easy for Kimi. He's a racer to the core! And yay for Dan too - F1 shows what it's got indeed! When it matters to you who's winning, it can be a nail-biting affair. Forget all the nonsense afterwards - Kimi is the 2007 champion! I remember that you mentioned Nakijima before I think it was the China weekend. Asia (Japan) needs a driver that can run in the top ten week in and week out. This would be beneficial to the sport. I think that this is the man to do it. Aside from the fact that he ran over his own crew members he was very fast and drove a smart race. The race was fun to watch. I DO NOT want Kimi to lose the title because of the Cool Fuel issue. With all the bad press for this year I think that McLaren should drop the appeal. Kimi won the race period and won the title. Hamilton lost this race because he let Alonso get to him. The mistake of trying to race Alonso did not take him out completely that was from a mechanical problem. Hopefully this puts to rest the favoritsm issue for Alonso. McLaren (Dennis) should let this go and focus on 2008. Remember that Lewis is a "ROOKIE" he has many more years to win a championship and there is no doubt in my mind that he will. Maybe not next year but he will sooner than later. Concern over what a problem produces becomes irrelevant once the problem itself has been eliminated. Past practice has established that refueling is not necessary for good racing. Eliminate refueling and F1’s overstuffed rule book will automatically shed itself of this entire controversial section. Yes, the inherent risk and expense of this practice will also meet a similar fate. Will it happen? I fear not. Why? Mrs. Mosley’s little boy *Maxwell is a lawyer. Lawyers glean a significant part of their income from arguing the controversial laws they draft. Much better in their mind to add further sections and subsections, which far from fixing the problem, will most certainly need future interpretation and addendum too. I am not so sure that eliminating re-fueling is a good thing. I like the strategy involved with it. If it is a safety thing. I hate to say this but NASCAR has the right idea. A few years ago there was a fire in the Benneton pit. I thought that it would change the way F1 pits. Number one there needs to a pit wall to seperate the trailer from the cars. They need to eliminate refueling under pressure. It is obvious that under pressure a fire is magnified with the larger mass of the fuel. Also a rule (sorry Clive) is needed for the number of crewmembers are allowed over the wall. It was my impression that the Benneton fire would change things. I feel that the FIA is waiting for a catastrophy until it changes the pits. Agreed to everything you guys put in your first comments, John and David. As for John's second, I understand the point about strategy but would suggest that most people do not get a lot from the complexities and cleverness of F1 strategy. They watch to see the cars and drivers racing on the track and any appreciation of Ross Brawn's brilliance in timing a pit stop to the right lap to gain the most advantage is entirely lost on them. I, for one, am prepared to let that aspect of the sport go, if it means we can avoid some of the ridiculous nit-picking that goes on over rules that nobody cares about. You got me there Clive. OK let Bernie come up with his own idea and I am sure if he is thinking about $afety it will look alot like a NASCAR pit. I have to disagree with one thing Clive-- I would like to think that F1 fans are more intellegent on the whole then say NASCAR fans. And they seem to understand the complexities of pit strategy. So in the long run (we) fans will adjust. Then it becomes part of racing. And you got me there, John - in fact, I've written articles in the past pointing out that F1 fans are far more knowledgable than Bernie or Max ever give them credit for. They are the most informed about their chosen sport of all sports fans, I think - they have to be, when you consider all the things they have to know about. There's one thing i jut can't agree with you on. Th have refueling and pitstops banned, would make the sport even more dangerous. The cars would have to carry conciderably more fuel, and the tires have to last an entire race-length. That would not be fun to watch, and it would just make the sport even more booring. Pitstops is adding to the action and speculation around the race, and helps keep the race alive at times when it is really needed. To have the cars carry fue enough for the entire race would also make them too dangerous would there be any serious crash in the first half of the race since theres more fuel aboard, and as a result, heavier cars. Making them potentially taking more damage heading into a wall or catching fire. And now on to the rules and regulations. There's one simple resolution to the whole problem. Take a notebook, write down the most essential rules, and scrap the rest. Then there can be new ones made as the time goes on and the need for them appear. It's no need to keep rules that have never ever been applied, because the sport is changing so fast that there's no way to make 20-year old rules apply. This routine should then be applied about every ten or fifteen years. That's about what i have to say about rules, so now i will try to give you the ultimate sollution to the fuelriggs. The FIA own the fuelriggs, am i right? They are the ones building them, or at least drawing up the sketches about how they should be built. They provide the fuel that's inside the riggs during the races, so that all cars run on the same fule, right? So, i can't se what's the problem. It's not up to the teams to get any punishment, it's the FIA who should get the spanking. And the race it self then, well, i don't really know where to start. The risk is that this comment will grow longer than the article getting commented. I will begin with Kimi, it's inevitable. He's the only one in the championchip who have fought for so long time, and have been pipped of the chanses so many times so he is clearly the most deserving champion. There's no one, i think, who could possibly dissagree with that. Hamilton made a race of a champion, atleast after the car had put him back into eighteenth place. Then he found himself, and found the focus to get him going. And such a drive then, putting in fastest lap after fastest lap, passing cars both on the right and left. But at the end of the day i think his own comment about the whole thing, that i read at BBC, was the best. He just seem to accept what had happened, and the result of it, and said he would probably get many more chanses in the future. And he also said that he did'nt want to win the championship because of someone getting disqualified with grounds in McLaren appealing the stewards verdict. He would gladly have won on the track, but was ready to accept that he did not, and instead look forward. Talk about beeing a good sport, huh. McLaren have never really been my favourite team, mostly because they never seem to be able to put together a car that keeps it together for a whole season. The reason i like McLaren, is that i always seem to be able to find the best drivers. I mean, look at their merits. Hakkinen, Raikkonen, and now both Hamilton and Alonso. Not to forget Couthard. One of the best sportsmen in the history of F1, even though he never have been a champion, he have always been there and proved his talent time and time again. And to keep it up for so long, he really have to be an incredible man. I can't say that McLaren's point's in my popularity-table have rissen this season either, with the spyscandal and all that have been going on around the team. There's just one man who really have hit rock bottom this season, and he really have deserved it. Alonso. Fernando Alonso. I can not believe this man. How the f**k can you come into a team and start behaving as he have??? Undermining the whole team, threatening to give them away during the FIA-hearings, even though he was playing part in the team and passing on information from the Ferrrari-documents. And on top of that, complain when the team start to protest to your way he have handled things, and start saying he deserves more gratitude and a higher status. No way, i would throw him out the door head first. And that's about that. I think i have made my heart and soul atleast a ton lighter now. And cleared out a lot of my thoughts. It really made my feel warm inside to hear that you appreciated my last comment, so i hope this one won't make you change your mind. As i said then, quality comes with time, so i hope the 22 weeks until the next race will be used in the best way possible by the teams and by FIA to provide us with some quality entertainment next year too. Even though this year has been turbulent, the quality of things have not always been that good. Take your time guys, and think before acting. Nothing gets me more upset when under yellow leadership can change in the pits. (which happens alot in NASCAR). But given green flag stops, the decision of how much fuel, change tires or not ,is a stratagy that I look foward to. Another words the team members are more responsible for the win or loss as opposed to no pitting at all. I don't want our races to appear that the driver is the sole reason for the winning or lossing. I like the team atmosphere during the race. I just think that it (pitting)can accomplished safer then it is today. About the fuel rigs, however - the FIA originally designed the specifications and then put the manufacture up for tender. A French company won and, as far as I'm aware, they still make them. The feed is not pressurized, in fact, the spec dictating that it be gravity fed. And each team has its own fuel supplier - the fuel is submitted to the FIA for testing for its legality and then the okay given. Temperature of the fuel at the point of delivery to the car is very much up to the team - they can cool it if they want to risk getting caught. Hence the trouble in Brazil. Throwing all but the most basic rules away is a great idea and more or less what I've been saying all along. Sometimes I'm surprised that we don't get more protests and controversies with the rules becoming as complex and difficult to interpret as they are. As for your thoughts on the drivers, I think we are pretty much in agreement - Kimi is a worthy champion, Hamilton handled it well and Alonso... Well, Alonso is still young too, isn't he? An excellent comment, Björn, as ever. I am glad that you feel able to put your views in this debate without fear of insult or abuse. That's the great thing about F1 fans - what unites us is love of the sport and we're not going to fall out over some disagreement on minor issues! Here's hoping for a much less controversial season next year. I did not advocate eliminating pit stops. Only that refueling during such stops be eliminated. The past practice of carrying full race fuel from the start did not create any significant danger on track in its more recent, safety induced, phase and most certainly eliminated that factor in pit lane. This past practice did not prevent pit stops for any other reason, and nor should it. To advocate a total ban on pit stops would most certainly be an irresponsible, retrograde step since it would eliminate the opportunity to replace worn, punctured, faulty, or inappropriate tires, and make whatever repairs or adjustments, etc., that may be necessary to keep the cars on track and performing to capacity ... all of which I am fully in favor of. PS	Ron Dennis and McLaren are already bogged down in a quagmire of legal matters. Perhaps he/they should consider clearing this (planned?) distraction away and getting on with their primary task of creating a winning ‘08 car. Adding to their problem can hardly help matters when there is little chance of plucking the title out of Kimi’s hands ... and nor should that happen. I have to say thank you to bjorn for speaking your mind. I like to hear what other people are thinking. Especially Europeans. Clive is correct about the fuel rig. But Clive I honestly thought that the rig is what pressurizes the fuel and the reason was that there was a uniform flow for every team. I did not know that each team had it's own fuel. That is foolish the fuel should be the same for every team. This way the FIA could sell "the official fuel of Formula 1". Bjorn you are correct on Kimi being more deserving to win than any. I am glad to hear that I am not alone about Alonso. If most europeans feel this way then he is only liked in Spain. I am sure that some Spanish have the same opinion as us. You are also correct about McLaren. It appears that consistancy is still an issue in Woking. No way could Hamilton ever be pleased with winning the championship under an appeal to the FIA. He has many more years to go. We know that you have to change the tires as was evident with that experiment 2 or 3 years ago. So pitting for tire changes must stay. I fell that the pits should be closed under the yellow except for emergencies such as a cut tire from debris caused by the crash that set the yellow. I would like to adress the rules. THE RULE BOOK OF TODAY MUST BE DISCARDED. the new rule book has to be more flexible with technology changing from week to week. It also must include "exclusions" for instance TC for next year. I do not want a team to say " show me in the rulebook where it says that we can not use a certain item". A permanent rules committee must be formed and hold meetings after every race (short meetings) there should also be a provision that any committee member can call a meeting of the rules committee at any time. Ok no more refueling in the pits. How much redesign of the chassis will be needed to accomodate the new larger fuel bladder? In total agreement on pit stops for tires only, David. And I think you're right that McLaren should just leave the whole issue of cooled fuel and let the season end so they can make a new start. But Ron seems to think it's worth clarifying why the stewards penalize some days and not on others - that's what it's really all about, not points. He is within his rights and, since he's already been called guilty for not appealing on several occasions this year, I can understand him making the point this time. Maybe the fuel should be the same for all, John, but F1 would lose a lot of sponsors if it were all made by one manufacturer. Ferrari use Shell, Renault Elf, McLaren uses Mobil (not sure if they still do) - read the ads on the cars and the fuel supplier will be there somewhere. Of course, it's supposed to be to the same FIA specification and that is why the FIA checks the teams' fuel before and after each race. But that doesn't stop the fuel supplier from shouting about how good his product is if his team wins the championship! The solution is 1. Kimi stays champion. 2. the Sauber BMWs and Williams cars eliminated for contructor points. Better still, let's forget the whole business, leave things as they are, and get ready for the next season. Nick Heidfeld for Champion! OK enough bs from 2007. 1 Take rule book. Roll it up tight. 2 Stuff said book down throat of Mad Max. 3 Wait whilst aforementioned book is digested. 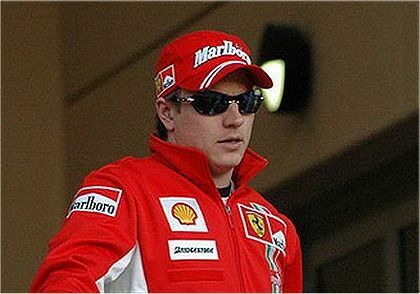 Well done Kimi the Kool! A deserved win. Thank you Clive for presenting a blog that is informed and well written. Thanks also go to your (many) readers and their worthy comments. Mostly, thank you for being able to present my own thoughts. I go away from every blog with the feeling I have gained a litle more Insight. Therefore - Who has tapped into the telemetry system of the Hamsters car and has a tiny remote button that can put it into neutral? And, more to the point, WHO has their finger on the button? Jokes aside - A great race and a fine end to a weird season. A message for Max regarding rules - KISS: Keep It Simple Stupid! The Hamster will be in the mix for next season and as John F (et al) observed, onlyy 22 weeks to go! Thank you for your kind comments, Fractal - it is always a pleasure to have your input into our little debates here. One thing I have noticed in my little trips around the blogs and forums is that there is almost universal agreement that Kimi is the right champion, regardless of all the hoohaa of the season. He is like an island of sanity in the sea of nonsense has swamped F1 this year. Ever since the McLaren appeal concerning the 'cool fuel' issue surfaced two names have gone into hiding. Do I have to name names? I wonder what they're planning to make this issue "go away"? The plot will have a price tag attached to it. If there is a way to make a dollar the issue these two men will find it and exploit it for themselves. I think that way back when the actually cared about the sport, but today it appears that all they care about is money. They say that money is the root of all evil. How can anyone refuse our self-sacrificing offer, John? I am certain that grateful people are mailing us their checkbooks and credit cards right now, desperate to be free of the evil influence such things have exerted upon them for so long! It brings a tear to my eye to think of how happy they will be! Clive, John F, you do make me laugh!